Dance Commentary by Heather Desaulniers: "What Stays"
The last days of June saw the return of Right Brain Performancelab’s dance theater/performance installation “What Stays”, co-produced with Dance Up Close/East Bay. A mobile, multi-disciplined art piece directed by Jennifer Gwirtz, “What Stays” features a powerful combination of music, soundscore, text, dance and mask. This most recent iteration inhabited the entire Shawl-Anderson Dance Center, utilizing the porch, vestibule, staircase, two downstairs studios, two upstairs studios, dressing rooms and even the roof. As the audience was ushered from space to space, a deliciously wacky set of interactions transpired. The key narrative of home underscored the entire work, yet each vignette approached the notion from a unique perspective. Prior to entering the building, the audience was greeted with a short prelude on the front porch. Two dancers, accompanied by a cellist, set the mood with spinning and cycling circular motifs. In the lobby, a clever and brainy solo scene took on the topic of journeying while a virtual contribution spoke of corporeal presence and hospitality. Attention then turned to the staircase where three dancers explored the complexity of their changeable landscape. They clung to the edges - walls, banisters – while searching for answers through listening, touch and sight. Our next station was the first of two studios on the ground floor where a single dancer examined the possibilities of choreographic style and genre. Through a combination of ballet, modern and even a little ballroom, she posed the question – which felt right? 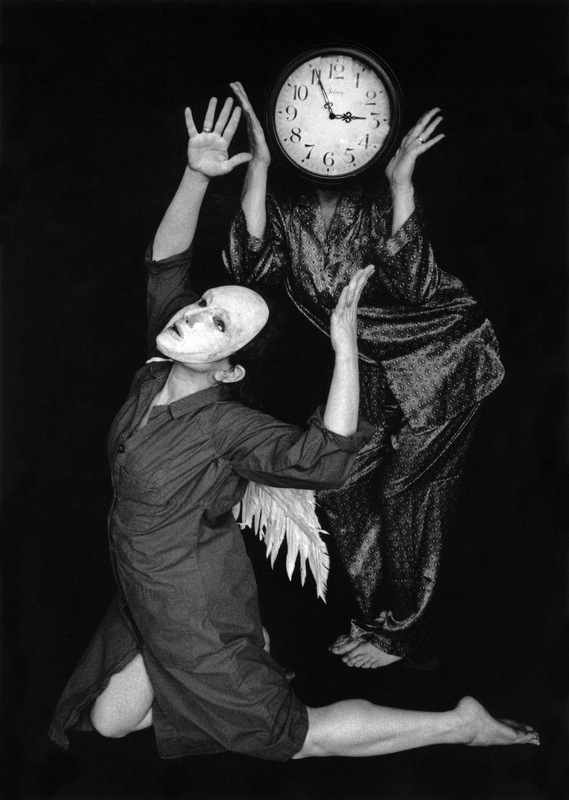 Back at the front desk, exaggerated gestures, goggle-wearing performers and intense absurdity brought a hint of Butoh to the table. Onto the second downstairs studio setting, which opened with a long, impressive monologue, peppered with songs. Then, a dancer entered through the side door of the studio, masked, wearing angel wings. Accompanied by a sound mosaic (cello, other instrumental noises, recorded music and vocals), she performed a series of slow, defined movements that also clearly took inspiration from the Butoh tradition. Following this excerpt, the hospitality theme returned with an interactive, participatory tea ceremony. This shared experience culminated with the cast drinking their tea while performing classical ballet barre exercises. Quickly, composure and control gave way to some humorous and unpredictable shenanigans. Our last two stops for “What Stays” were the upstairs studios. The first had some of the most beautiful modern dancing of the ninety-minute work, and the second, a concluding sentiment as the numerous disciplines re-emerged to close the piece. “What Stays” did a great job of delving into its chosen narrative with a variety of scope and perspective. And even with the number of times the audience was moved to a new location, the flow was never once interrupted. The only issues were compositional in nature. First, the piece is subtitled as ‘a performance in three acts about home and time passing’. The latter part of the statement, the narrative foundation, was super clear, but the presence of three acts was not. “What Stays” seemed more like a single stream of consciousness rather than a triptych. Second was the ordering of the installation or more specifically, which scene concluded the work. It wasn’t that “What Stays” was too long, not at all. But the tea ceremony scene absolutely felt like it should have been the finale. While the last two segments had their own artistic merit, in the context of the overall piece, they felt like an extra, unnecessary coda, tacked onto the perfect cadence that had already been resolved.